Manufacturing ERP software eresource's manufacturing ERP software is the most economical and effective manufacturing ERP system available in Indian market today. The Web-based eresource ERP for Manufacturing is a comprehensive industry-specific ERP software developed exclusively for Indian manufacturing companies. Though this ERP software is an ideal ERP solution for Small and medium sized Indian manufacturing industries, many large scale manufacturing companies in India also implemented eresource ERP System for manufacturing very successfully. When a time automation is changing our way of life, no business can survive without adapting to the technology changes, that includes the construction industry. It is irrelevant how big or small your construction business is, ignoring the writing on the wall can only lead to collapse of your business. This is because the market is getting sophisticated with customer-oriented competition and everyone is conscious about not to miss single opportunity to overtake their rivals in their business arena. Benefits of having an efficient ERP system to manage your construction business are numerous. 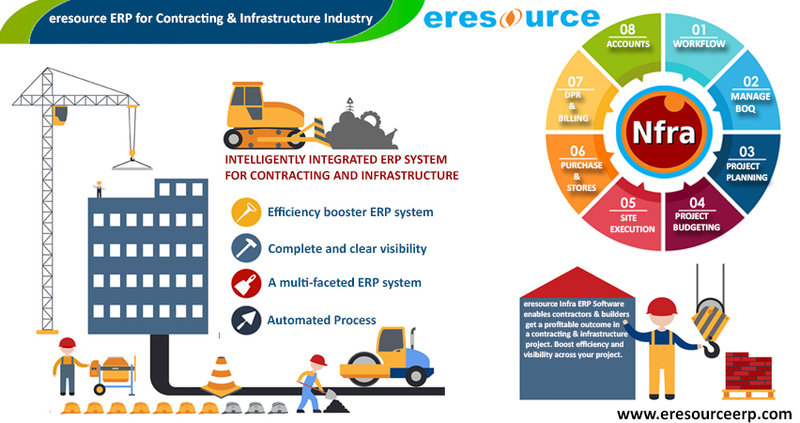 From being a software tool to help manage your routine activities in a construction industry, ERP systems like eresource Nfra ERP for construction Industry, has been transformed into a business application that keep tap on every single business operations from project estimation, to project management, labour management, material management and accounts management etc. The benefits a construction company will have from eresource Nfra ERP system is endless. The system has been developed exclusively for construction and infrastructure industry and its popularity among many leading and mid-sized construction business organizations are increasing day by day. Days of using separate software applications for estimating, scheduling, risk management and other construction activities are now fairly tales. eresource Nfra integrates all these activities in single system with systematically designed modules that takes care of all operations in an construction organization. There won’t be any duplicate data entry and updates anymore. The flawless and error-free method of feeding the data into the system can eliminate waste time and the saved man hour could be spent better elsewhere. Undoubtedly it is going to be one of the other hundreds of benefits that eresource Nfra ERP system could offer to Construction industry. 4. Digital documentation management helps flawless working method. 7. Work from anywhere, anytime advantage. eresource Nfra has been implemented hundreds of companies in India, UAE and many African regions. Being a leading web-based ERP application, eresouce Nfra is getting upgraded periodically all the technology advancement and our professionals are working on making existing systems more intelligent in the coming months and years.. Priority is given to projects that result in efficiency and quality gains or that reduce complexity and thus facilitate control processes. Several years of our service in this field has made us the pioneers in ERP system development and our development are based on our thorough industry-related studies with all the relevant operational methods. As per the studies contacted our professionals have realized that success of any business depends on the right decision making ability of the management. Only a quick information data transfer could help timely decision making and that is the core of any business success. Our systems are designed with capability to cope up with quick and easy information data transfer between various branches and departments that includes all decision makers. Apart from the above advantages and benefits, eresource Nfra ERP for Construction and infrastructure industries has been designed with customizable dashboards with integrated data visualization and data analytics features which are a daily necessity for construction managers and become even more vital during times of distress. Having said all these benefits, we also would like to emphasis the point that without proper implementation and customization of ERP systems, for which eresource is an expert, construction companies will have a harder time overcoming difficult or unexpected situations. 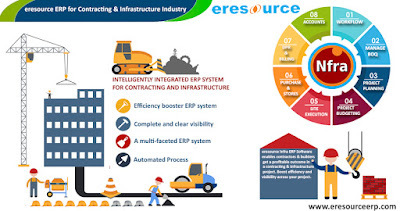 To know more about eresource Xcel ERP Software for construction Industry in Mumbai, Pune, Bangalore, Ahmedabad, Surat, Vapi, Delhi, Chennai, kolkata, Hyderabad, Telangana, Andhra Pradesh, karnataka, Madhya Pradesh or any where in India Please call Mr. Bhavin for live demonstration at 9004617760 or email at sales@eresourceinfotech.com . eresource Xcel ERP system for manufacturing industry also provides robust business intelligence capabilities for monitoring the health of manufacturing system; analyzing business data in real-time and making valuable decisions. The solution also offers modules to manage accounts and human resource management with effectively. Eresource Xcel can be implemented in any types of manufacturing organizations including industrial equipment, automotive, electronics medical devices, aerospace and more. Construction Industry to a great extent, have understood that without adjusting to the universe of hi-tech, survival in this field will not only be troublesome but also incomprehensible as well. In any case, there are still some construction organizations that are hesitant to confer their brief time and sensible measure of cash to confront challenges that are looked in the business. However, with the presentation of eresource Nfra, a standout amongst the best ERP solutions developed solely for construction industry and infrastructure by eresource, the pioneers of Web-based Construction ERP software in India, is getting wide acknowledgment among each kind of development and foundation organizations in India and around world, particularly in the Middle Eastern and as of late in the African nations. 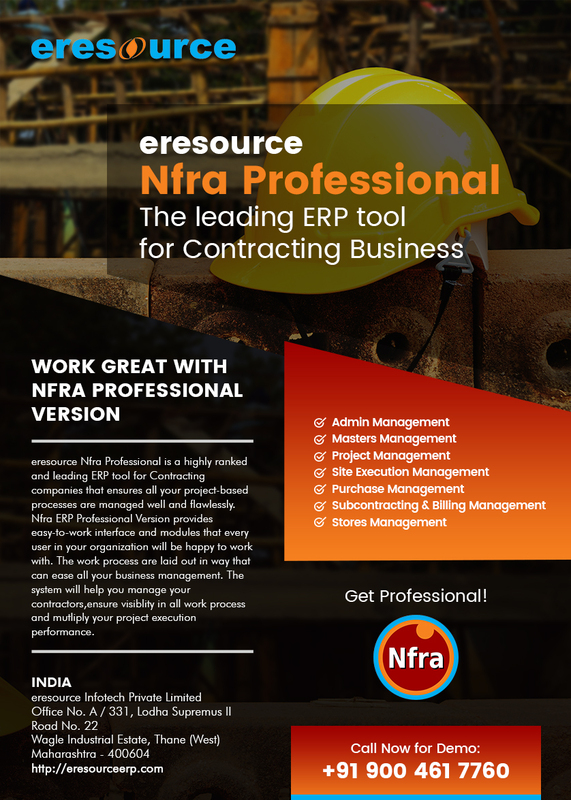 What makes eresource Nfra the most mainstream ERP for Construction Industry and Infrastructure ? Despite the fact that there are numerous reasons that can be called attention to, the essential and chief reason is its unwavering quality and reasonableness. Keeping separated the way that eresource Nfra being a NextGen ERP arrangement, organizations pick this framework since it is financially feasible. Today, when there are various of all shapes and sizes ERP arrangements accessible in the ERP advertise, eresource Nfra emerges being a one of a kind among others. Rather than proposing a typical ERP arrangement, eresource suggests selective answer for each and every industry. eresource Nfra has been created after a far reaching study and survey in the field of development exercises by our experts and recognized the territories that need exceptional consideration. While pondering the significance of having a framework like eresource Nfra, we give attention to the points of interest that can be conveyed by the erp system to the business. There are numerous organizations, similar to we have specified before, who are hesitant to go for ERP framework and have consented to actualize eresource Nfra ERP when told about the significance of having such a framework for the development of organization. When we say development, it isn't simply about tangible advantages, but the intangible advantages that the organization will have the capacity to accomplish over the long haul. As the innovation is changing on quick space, businesses, particularly Construction and Infrastructure industries can't remain a quiet onlookers. eresource Nfra is an intelligently integrated ERP system for Construction and Infrastructure that enables builders and contractors get a profitable outcome in a construction project. The system has been integrated with every module from sub-contractors to materials, outsourcing jobs and from plant management to mobile assets and labour. Construction industry being very complex, it is bound to face many challenges from its working areas. Construction companies always face these challenges right from the Project planning to the execution. Project costing, working together with suppliers, contractors calls for a high degree of visibility on cash flow, pricing and regulatory compliance all these activities are to be managed efficiently for a profitable and successful growth of a construction company. With eresource Nfra ERP for Construction you can boost efficiency and visibility across your construction project. 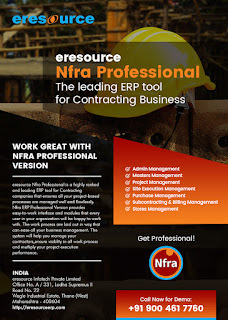 Today eresource Nfra has been successfully implemented in hundreds of construction companies in India and abroad and all these companies are operating all their business functions effectively. They have also successfully able to achieve ROI (Return on Investment) on this marvelous technological advancement. With the deployment of ereosurce Nfra for your construction business procedures all your functional process becomes easy and transparent. Land analysis and handling complex approvals and sanctions becomes an easy exercise. The system provides the provisions to help you identify your potential customers in advance and helps you update them as per their preferences. eresource Nfra for construction and infrastructure industry is an end-to-end solution for every construction related work with a clear visibility of all activities both on site and off site Complete visibility is required because the Construction Industry is known for cycles of growth and decline and cost over-run is an traditionally the inherent risk in the construction industry is based on cycles of growth and decline and cost over-run. However, these are managed effectively by intelligently scheduling various activities and sub-activities in eresource Nfra ERP System. Our ERP system eliminates all your paper and manual process inefficiencies and enables all your business data getting processed electronically. Being a cloud-based and web browser-based ERP system, eresource Nfra helps you work from anywhere at any time. All the users and decisions makers are given right to work and check permitted information on real-time basis, work process and decision making becomes easy. This time saving advantage helps quick implementation of decision taken which ultimately helps the growth your business. All the important modules that are essentially required to manage your Projects, Accounting, Sales and Marketing, Tenders and Site Management all integrated systematically and in a user-friendly manner integrated in eresource Nfra. The modules also help you generate accurate and timely invoices based on work completed and get accurate results on project costs. Our system has comprehensive multi-site Project Management capabilities and it provides details of the daily progress of each sites, full accounting details including the petty cash, details of material management, a clear vision of warehouse management, movement of heavy machines, managing receivables and payables, etc. Over the years, resource has been proven itself as the pioneers in the Web-based ERP application. This exclusive product eresource Nfra is a multi-faceted ERP system which could serve Oil and Gas industry apart from all other project-based industries. Primary focus of eresource Nfra system is on multi-firm organizational structures, field service, repair and preventive maintenance operations, diverse project management requirements. The system has been developed to handle contract types including EPC, general construction and maintenance. eresource is on the path of controlled growth in construction and infrastructure, Oil and Gas, Manufacturing and Chemical industry. Also eresoure is having the world class Manufacturing ERP Software beginning from India we have now extended our services in UAE and other Gulf countries. After establishing a successfully we on the path of establishing a deep presence in the African region. We are already serving a number of organizations in Nigeria and Nairobi and we have our channel partners in the region. With eresource in the Africa, the region’s Construction and Manufacturing companies are getting ready for a big change in their way of doing their business.